We had agreed to meet up with some friends to watch the fireworks at Great Meadows at 7:30 p.m. I fed the dogs dinner, made sure they had been out, then crated them with some chew toys - thinking that would be the safest place for them to be. I asked my eldest son to stop by (he was at a friends house) to check on the dogs around 10:30 p.m. (Realizing that the sun doesn't set until around 9:00 p.m.) We then received a phone call asking where had we left Hero when we left the house? "In the crate of course, why?". Well, what he found was the front of Hero's crate dismantled- the picture above shows it after we had reassembled it- (pictures for the blog actually weren't my first thought when I arrived home- sorry) and Hero upstairs. This meant that Hero not only busted out of his crate but jumped the 3 foot baby gate at the family room door. Hero? My Hero ?, who on an activity scale of 1- 5 is a -1?? He was uninjured except for the top of his nose being rubbed a little raw and his gums being a little bloody. (As I write this it would no longer by visible in a picture.) While we assume it was the fireworks, my son said he did not see or hear anyone blowing off fireworks in our neighborhood by the time he got home. Needless to say ,next year I stay home (though I really hate the idea of leaving Doug responsible for all 4 kids alone- especially in a huge crowd). I guess what I'm saying is the 4th of July is NOT my favorite holiday! Then Monday we said Vaya Con Dios to Mackey. Also not my favorite thing!! Who would have thought that we could become so attached to him in only 9 days? Of course, those of you on Facebook have already seen these videos/ pictures. Somehow a quick post to my Facebook Wall has just seemed easier than trying to put together a coherent Blog post lately, sorry. Introducing Kiowa Talk Mystic (aka Mackey). This is a short, no-fail, type foster, because he already has a family who is excited about adopting him after July 4th. I guess it is a good thing, since there are an awful lot of people over here, who would be tempted to foster fail with this fellow. In fact, there is still talk of hiding him in the closet when the time comes to deliver him. very slow "woe is me" walk when he is removed from the sofa. I also want to take this opportunity to thank all the service men and women who defend our country and this very precious thing called freedom. Happy July 4th, one and all !!!!!!! Jillie Ann made her way to her forever home on Saturday. She must have really liked the idea of going for a car ride, because she wagged her tail so hard , she gave herself a case of "happy tail". It AMAZES me that such a teeny, tiny, cut at the very tip of her tail could spray so many droplets of blood so far and so high. The spray was very fine, but it still gave a pretty good impersonation a crime scene (luckily I did not attract the attention of the police ;-) Fortunately, the bleeding was easily stopped, and the cut was barely visible. Unfortunately, I hear that Michelle (who was holding the adoption at her house) got a repeat performance on her walls and rug (Sorry guys ! I did try to get word to you beforehand). Yes, I now have a first aid kit in my car as well. I purchased an extra one on Sunday at our monthly VAGA meet and greet at PetCo. We continue to make progress with our current foster hound- Jill E. Ann (Jillie). She arrived with a few extra friends/stowaways (fleas) who were quickly dispatched. Next we dealt with a limp, from an apparent pulled muscle of her front right leg (which meant several days of rest- very short leash walks, Rimadyl, and putting off learning the stairs). We have not seen her limp in a few days, so her walks are getting progressively longer, and we are starting stair training, hopefully that and the bitter apple spray will help focus her on more productive uses of her time and energy. So do you think the cat knew that he was driving her crazy? Trying to turn it back on by the sheer force of her will? Or just admiring the gorgeous hound reflected in the television screen? One way or the other, you have to admit that is one impressive "sit". 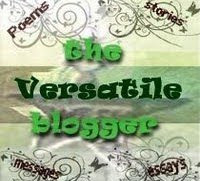 I am very greytful to our friends at Life's Little Moments for thinking of us for the Versatile Blogger award. 2) My DH (Darling Husband) Doug and I will have been married 22 years this July. 4) We adopted our Jack Russell- Beagle mix- Pepsi, on Super Bowl Sunday 2002. 5) 4 weeks after we adopted her, (while on a walk) she was mauled by a neighbor's dog (a large shepherd mix) who had gotten loose. And required immediate surgery. 2 weeks later she was attacked again by the same dog. Those neighbors have since moved away. 6) In July 2008, while researching dogs that might be able to tolerate a 28 pound Diva, with SEVERE large dog fear issues, my daughter Alaina discovered a retired racing greyhound rescue site. By August 2008 we had adopted Hero (racing name Star All Star), our 85 pound couch potato extraordinaire. 7) Adopting Hero has changed my life in so many more ways than simply adding a four legged friend . We said happy trails to Miss Daisy on April 30th, she has found a wonderful forever home; complete with 3 little boys to love, a greyhound mix brother named Micky, and wall to wall carpeting! So, we now have a new house guest- Jill E. Ann. At the kennel in Orlando they called her Annie, but my kids insist on calling her Jilly-Bean. Unfortunately Alaina found out the hard way what happens when chocolate bunnies are left in the sun. Next came Genna's 12th birthday (literally- her birthday was the day after Easter this year). Of course her actual party waited until the following weekend. The theme was "at the movies". The girls made their own "American Idol " video. And "cardboard Chris Pine" made a surprise appearance. Don't you just love siblings? I promise Mark is not flipping anyone off, though it certainly looks that way. VAGA president Debbie Ackley with Maggie. The following Tuesday (yes- Tuesday) was Alaina's confirmation. (with brother Eric as her sponsor). Small, rural, churches do not get a Saturday visit from the Bishop of the dioceses. So instead we had Tuesday evening with the Bishop from Juneau, Alaska. BUT PLEASE do not think I am complaining !!! You see, we actually left our very large church about a year ago, to start attending a small Catholic Mission, which holds mass in the local junior high school's cafeteria. There are many reasons why, but I think the following anecdotes say it all. She explained that the dog was old, and had seizures, and that she refused to leave it home alone. After all she said, it would just sit on her lap and wouldn't bother anyone. Will and I heartily agreed! I told her if Hero would fit on my lap I would be very happy to do the same. It is generally frowned upon to take pictures in the church- but I am now really kicking myself for not sneaking a picture. A few days later, the same little girl was helping her mother with chores, and as children often do (play questions and answers off of each parent) asked her mother the same question. The little girl was truly shocked and amazed by this answer and went running to find her father, very upset. "Well, I just asked Mommy the same question, and she said we came from monkeys! One of you is lying!" "Oh", her father said calmly. "That is actually very easy to explain- I was talking about MY side of the family and she was speaking about Her side." Compare this to churches where we have literally had 1/2 hour sermons on how most of the congregation is not dressed appropriately for church, and you can see why I LOVE these people! This past week the brand new "Piedmont Dogs" off- leash park (at Vint Hill) opened it's gates. A HUGE thanks to everyone who helped make this park a reality. Miss Daisy LOVED the little dogs :) But honestly it was more "herding" than chasing down prey. No, those are not deer running across the field, they are some of our good friends from VAGA (Harper and her daughter Sara). Next weekend .... GIG (Greyhounds in Gettysburg). - This is the whole pack and their tags. I've Moved - Come join me on my new food blog, well, it's about a year old now! In Patti's Place I'd love to see you there! Halfway to Crazy ~ Oh, wait, we're there. We've moved....... - to a new blogging site. www.lovinglifewithhounds.wordpress.com. We hope you continue to follow along! !